The first and only comprehensive examination of the universal but widely misunderstood practice of grudge-holding that will show you how to use grudges to be your happiest, most optimistic, and most forgiving self. Secretly, we all hold grudges, but most of us probably think we shouldn’t, and many of us deny that we do. To bear a grudge is too negative, right? Shouldn’t we just forgive and move on? Wrong, says self-appointed grudge guru Sophie Hannah, in her groundbreaking and irreverent self-help guide. Yes, it’s essential to think positively if we want to live happy lives, but even more crucial is how we get to the positive. Denying our negative emotions and experiences is likely to lead only to more pain, conflict, and stress.What if our grudges are good for us? What if we could embrace them, and use them to help ourselves and others, instead of feeling ashamed of our inability to banish negative emotions and memories from our lives? With contributions from expert psychotherapists as well as extracts from her own extensive catalog of grudges, Sophie Hannah investigates the psychological origins of grudges and also offers not-so-obvious insights into how we should acknowledge—and embrace—them in order to improve the quality of our interpersonal relationships and senses of self. Grudges do not have to fill us with hate or make us toxic, bitter, and miserable. If we approach the practice of grudge-holding in an enlightened way, it will do the opposite—we will become more forgiving.Practical, compassionate, and downright funny, How to Hold a Grudge reveals everything we need to know about the many different forms of grudge, the difference between a grudge and not-a-grudge (not as obvious as it seems), when we should let a grudge go, and how to honor a grudge and distill lessons from it that will turn us into better, happier people—for our own benefit and for the sake of spreading good and limiting harm in the world. On almost a whim Sophie Hannah decides to write a book on grudges, a topic she discovers no-one else has ever written about. Holding grudges is a universal psychological phenomena and although Hannah has no mental health background or experience, she feels comfortable tackling the topic, with the help of two mental health practitioners looking over her work. She takes issue with the definition of a grudge, identifies different types and themes of grudges, and when to let go of a grudge. She make On almost a whim Sophie Hannah decides to write a book on grudges, a topic she discovers no-one else has ever written about. Holding grudges is a universal psychological phenomena and although Hannah has no mental health background or experience, she feels comfortable tackling the topic, with the help of two mental health practitioners looking over her work. She takes issue with the definition of a grudge, identifies different types and themes of grudges, and when to let go of a grudge. She makes the argument that grudges have the power to be positive experiences, transforming a person to become a better human being and clarify their personal value system. This is not a book to dip into from time to time, according to Hannah, for the arguments raised to make sense it has to read from beginning to end.Hannah gives us personal anecdotes and evidence gained through social media as evidence of her research to back up the points that she makes. There are several multiple choice Grudge Quizes interspersed for the reader to evaluate themselves. She identifies the danger of revenge in grudge holding and the need to look at the intentions behind holding a grudge, processing it and learning from it before placing it in a Grudge Cabinet. I found Hannah's approach meandering at best, full of assumptions and questionable in its organisation/structure, and not all her anecdotes seemed to be pertinent. It is not Hannah's fault, but I am used to more academically rigorous approaches with clear goals and more structured and wider data gathering with more careful evaluation. For those who have little understanding of psychology and emotional mental health, they may well find Hannah's light hearted non-expert approach to the subject interesting and of value. There are interesting points such as celebrities who have been public in the grudges they have held, and there are countless songs and movies on the topic. From my own perspective, I have enjoyed a number of Hannah's novels, in my humble opinion, her fiction is much more successful than her foray into non-fiction here. Many thanks to Hodder and Stoughton for an ARC. I so wish I would have won the giveaway for this book as I loved it so much, I would have liked this to have become a part of my library.As the queen of grudge holding ( some go all the way back to the 1960s !! My rotten kindergarten teacher refused to let me take home my clay ashtray because she hated the fact that I knew how to read and often read to the other children - guess she felt threatened. Who knows ? ) I just HAD to get this book.The author's take on grudges is unlike the standard def I so wish I would have won the giveaway for this book as I loved it so much, I would have liked this to have become a part of my library.As the queen of grudge holding ( some go all the way back to the 1960s !! My rotten kindergarten teacher refused to let me take home my clay ashtray because she hated the fact that I knew how to read and often read to the other children - guess she felt threatened. Who knows ? ) I just HAD to get this book.The author's take on grudges is unlike the standard definition of them and do not involve hatred, bitterness, revenge, rancor or any other less than cheery or positive attitude toward the misdeed or the person who did it. Rather she gives a step by step approach on how to process them and how to file them away, not in hatred in bitterness but rather so that you learn from what was done to you and how best to avoid that from every happening again.The only teeny tiny bone I have to pick with her is she does not advocate ever cutting anyone out of her life. She gives stories from 1 to 9 on her grudge chart and some were pretty awful and not done by people who I want to continue to hang with. I guess her approach is to constantly be gun shy around them, limit or avoid time with them, but never making a formal break.I am learning the forgiveness process but it never includes an obligation continuance of the relationship. I truly wonder why Sophie Hannah wrote this book. Successful in her other offerings, she does not have the qualifications, credentials or training to write a book based on psychology; and it cannot be touted as a self-help book when her aim seems to be talking about herself. There may not be any current books about grudges, but is there really a need for one? Does the world need more people holding tight to every real or imagined slight?That is what this book recommends. Don't only hold on to yo I truly wonder why Sophie Hannah wrote this book. Successful in her other offerings, she does not have the qualifications, credentials or training to write a book based on psychology; and it cannot be touted as a self-help book when her aim seems to be talking about herself. There may not be any current books about grudges, but is there really a need for one? Does the world need more people holding tight to every real or imagined slight?That is what this book recommends. Don't only hold on to your grudges (proudly! ), but look for instances where you have less than satisfactory interactions, write them down, and physically keep them in a special place, for they are your story and lessons of your life. Then you can pull them out time and again to review them and treasure them! Yes, TREASURE YOUR GRUDGES! !The author even categorizes her grudges (naming well over 30 categories), as well as grades them according to their dreadfulness, impact, and intention. She proudly talks about the ages of some of these grudges (over thirty years!! YAY?) There are even rules for keeping and releasing grudges. Does this sound over the top to anyone else?I must also wonder if the author realizes that her book shows her in a bad light as a person who is easily upset with others who hurt her by not doing things, saying things or reacting in the precise way she thinks they should. Her first example of a grudge in her book (important because she could tell there was something meaningful happening as it happened) tells of a time she stayed with a married couple. The husband, Martin has a quirky obsession with his cat and must know where it is at all times. The author found herself awakened during the night, when Martin turned on the lights, entered the guest room and was searching for his cat under her bed. (I agree this was totally inappropriate behavior on his part!) However, Ms. Hannah admits Martin would throw himself in harms way if he felt she were being threatened and would not hesitate to help her should she be in need of anything. However, she determined that she has a grudge against him because on a day-to-day basis when she is in no danger or need, Martin puts himself first. She must remember that and take steps to protect herself. Really? You must PROTECT yourself from him? ?Another adage cited in the book - Vern and Fern visited the author and her two young children (her husband was away). It was dark when they were ready to leave. The author said she would walk them out to their taxi as there was something she needed to get from her car. They offered to stay in the house with the children (who were in bed) while she got what she needed. She insisted at walking them out and so she did. She was further infuriated when the taxi didn't leave and seemed to be waiting until she was safely back inside. She internalized this as a judgement against her ability to parent her children or to know what to do should she get locked out of the house. In her mind, she shouted out several "F-you! Just F-you!!" (abbreviation of the word mine) before giving up and going into the house. This too became a grudge against what I saw as a couple simply acting in a mannerly, concerned way.Ms. Hannah is very dismissive of psychologists and well-known authors in the field calling what they write "a load of crap!" , which is disconcerting. Most adults are well aware that not everything works out the way we'd like. We process our feeling, adapt if called for, note lessons learned, and move on with our lives. We don't proudly keep a physical catalog of all missteps committed against us!In another adage cited by the author, she asked her husband ""how would you categorize grudges?" "I wouldn't" "Well if you had to?" "I don't know, maybe x, y and z" "No, that's not the best way to do it!" I cut him off, excited by the idea I'd just had. He shrugged and left the room (possibly holding a grudge because I'd insisted that he participate in a conversation he didn't want to have, and then talked over him.)" Self-absorbed? You bet! Values others? Not so much.Unfortunately, I know several people like this, and my lesson learned is that they tend to be controlling, wanting/expecting others to react or voice their thoughts in a manner predetermined by the person needing to be in control to feel safe. They also tend to be self-absorbed, wanting every interaction to be about them. No matter the topic of conversation they turn it around to themselves. Unfortunately, most people, including myself, don't like to be around people like this as they soon tire of feeling judged and walking on eggshells.I don't want to spend the precious time I have on this earth cataloging, categorizing, grading, reviewing and TREASURING every wrong ever done to me. Life is far too short!! Beyond that, there is such a thing as grace, and rising above. Ms. Hannah is very comfortable with her chosen focus. I choose another path for my life - I choose joy!! Please stick to fiction, Ms. Hannah.Thanks to NetGalley and Scribner for allowing me to read an advanced copy of this book in exchange for an unbiased opinion. I am a great fan of Sophie Hannah's psychological thrillers, so this departure from her normal fictional output is quite a surprise - and something of an eye-opener, too.I suppose we would all like to believe we are too magnanimous to hold a grudge for long:- "forgive and forget” is the noble attitude to take – but only saints are truly capable of this, so where does that leave the rest of us lesser mortals?Sophie’s lighthearted treatise does not advocate seeking vengeance, but explains why ther I am a great fan of Sophie Hannah's psychological thrillers, so this departure from her normal fictional output is quite a surprise - and something of an eye-opener, too.I suppose we would all like to believe we are too magnanimous to hold a grudge for long:- "forgive and forget” is the noble attitude to take – but only saints are truly capable of this, so where does that leave the rest of us lesser mortals?Sophie’s lighthearted treatise does not advocate seeking vengeance, but explains why there are times when we need to take a stand – and not feel guilty about it:- “We shouldn’t allow other people’s inconsiderateness or even their cruelty to make us unhappy and affect our inner peace. We should simply tell ourselves that their bad behaviour is their problem, not ours. "Moreover, according to the recommendation given here, when you feel that you have a genuine grievance, it is psychologically healthy and advisable to stand back and analyse the situation, so that it doesn't fester at the back of your mind without resolution (or 'closure', as the Americans say)... then you can decide what to do about it:-"I’ve always wanted any present-moment meanness or poor treatment of me (or anyone else) to stop so that I can start thinking about it – because what could be more gripping, right? Is the person who did me this particular wrong dangerous, or was it a one-off? What should I think about them from now on? How should I treat them? Every time, it’s a mystery that needs to be solved, and I’m a mystery addict. (This probably explains why my day job is writing crime fiction and my hobby is reading it".Still feeling guilty? Let this further piece of advice and a quote by Winston Churchill ease your conscience:-"Holding a grudge is a statement of our own moral code. Added to that, it increases the likelihood that we will treat ourselves with self-respect, and therefore expect and demand to be treated respectfully by others. It is a way of saying to oneself, as Winston Churchill so pithily put it, “This is the sort of bloody nonsense up with which I will not put”. With thanks to the publisher for the ARC via Netgalley . I picked this up on a whim because the title was so very intriguing. It sounded like the antithesis of most of the self help books that are out there. Why would anyone want to hold a grudge? Nasty, small minded, grubby things...! I finished it thinking I neede to buy a copy for just about every teenage girl I know. This is not a book about holding onto pain or anger or ugliness. It's a book about using those things to grow as an individual, and to learn how to protect yourself from painful exper I picked this up on a whim because the title was so very intriguing. It sounded like the antithesis of most of the self help books that are out there. Why would anyone want to hold a grudge? Nasty, small minded, grubby things...! I finished it thinking I neede to buy a copy for just about every teenage girl I know. This is not a book about holding onto pain or anger or ugliness. It's a book about using those things to grow as an individual, and to learn how to protect yourself from painful experiences in the future. That's so important. We all experience pain in our relationships, to a greater or lesser extent. Some people can just shrug it off, but some of us can't. We need a way to process experiences so they don't damage us. Once we've done that, it's much easier to move on. It's not possible or healthy to constantly ignore negative emotions, and it's not healthy to be perpetually consumed by them. This book gives a structured way of reflecting on things and learning from them. Oh, and it's funny, and friendly, and supportive. It's the book equivalent of coffee and cake with your most generously understanding friend. I received How to Hold a Grudge for free through Goodreads' Giveaways program. I had never read anything by Sophie Hannah and am not familiar with her work at all.I could see that this was supposed to be a charming, self-help book in the guise of not being overly self-help-y (for lack of a better word). But I couldn't get in to it and gave up after skimming a few chapters. If a psychiatrist or psychologist had written the book, I think I would have reacted differently-- in part because I would t I received How to Hold a Grudge for free through Goodreads' Giveaways program. I had never read anything by Sophie Hannah and am not familiar with her work at all.I could see that this was supposed to be a charming, self-help book in the guise of not being overly self-help-y (for lack of a better word). But I couldn't get in to it and gave up after skimming a few chapters. If a psychiatrist or psychologist had written the book, I think I would have reacted differently-- in part because I would think there would be science and or data involved. I can see how some people would think this book was "charming," "cute," or "fun," but for me, a major grudge holder, I wanted to see some actual data/science/research rather than a bunch of anecdotes. It felt like the author got a lot off her chest in writing this book and hoped to help readers do the same in theirs. It didn't work as a cathartic for me, but may be just the thing for others. It seems to me that, maybe during a period of writer's block, the author sat doodling for a while and came up with this. I think it must be aimed at the Young Adult market, because as am Adult Adult I find the tone immature, silly and patronising.She makes the argument that grudges can actually be positive experiences, identifying different types of grudges, when – indeed, if - to let go of a grudge. In fact she takes issue with the very definition of a grudge. Apparently a couple of professiona It seems to me that, maybe during a period of writer's block, the author sat doodling for a while and came up with this. I think it must be aimed at the Young Adult market, because as am Adult Adult I find the tone immature, silly and patronising.She makes the argument that grudges can actually be positive experiences, identifying different types of grudges, when – indeed, if - to let go of a grudge. In fact she takes issue with the very definition of a grudge. Apparently a couple of professional mental health experts cast their eyes over this work. Who would have thought!Using snippets from social media along with personal experience to back up her “research” she has sprinkled the book with Grudge Quizzes in order for readers to evaluate themselves. Oh please. This is the stuff of teenage magazines. What a strange little book-that-should-have-been-a-magazine-article. I think I picked it up because I saw an interesting review (somewhere? Not on Amazon) and also because epic and permanent grudge-holding is one of my few talents. But this was a very strange book not worth the time to read, that required lots of skimming.At first, I thought it was a comical book written in the guise of a self-help book. I mean, who would really want a self-help book about how to hold a grudge? Either you alread What a strange little book-that-should-have-been-a-magazine-article. I think I picked it up because I saw an interesting review (somewhere? Not on Amazon) and also because epic and permanent grudge-holding is one of my few talents. But this was a very strange book not worth the time to read, that required lots of skimming.At first, I thought it was a comical book written in the guise of a self-help book. 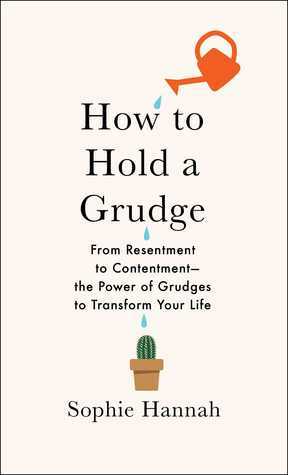 I mean, who would really want a self-help book about how to hold a grudge? Either you already do it too much, or you don't and you don't want to start now. But no, it was fully fleshed out into a self-help book, complete with lengthy multiple-choice quizzes about how to rate each grudge.Basically, most of the book was the author complaining. A "Festivus"-level airing of the grievances. But long stories about people who have wronged you are only slightly more interesting than hearing someone recount their dreams.I had to wonder, did she make all of them up? Or are all these grudgees in her life now super pissed at her? I often wonder that about memoirs. Once you air your dirty laundry, don't you essentially have to go into the witness protection program?Anyway, don't waste your time, BUT at least it does make you examine your grudges and if they're still worth holding, at least accept your anger and let it be and go do something else. Still something I need to work on regularly! How To Hold A Grudge had me intrigued the moment I saw it. The bright yellow cover, the shiny green foil spine and the title. It was a triple threat. But, could this book really teach me something, or is it a bit of a 'fad' self-care read with a few jokes along the way.Unfortunately, it was the latter for me, which is sad because I had such high hopes. You see, I can burn with resentment in a heartbeat if I feel excluded or a cutting comment is flung in my direction without warning. If people t How To Hold A Grudge had me intrigued the moment I saw it. The bright yellow cover, the shiny green foil spine and the title. It was a triple threat. But, could this book really teach me something, or is it a bit of a 'fad' self-care read with a few jokes along the way.Unfortunately, it was the latter for me, which is sad because I had such high hopes. You see, I can burn with resentment in a heartbeat if I feel excluded or a cutting comment is flung in my direction without warning. If people take advantage of me, I'm immediately in grudge mode and I definitely take bad customer service personally. So, why didn't this book deliver for me?The Bible tells us to love our neighbours and also to love our enemies; probably because generally they are the same people. - G.K. ChestertonWell, it wasn't all bad, I just couldn't take it seriously, or glean any practical tips to help me in my grudgefest. A pretty large chunk of the book is filled with funny anecdotes and conversations, but after a while, I started skipping pages, which any book blogger knows is a bad sign. There are also some quizzes and steps to understand, categorise and file your grudge away in a 'grudge cabinet'. This is where I started to drift and couldn't be reeled back in. I just don't have the time to go through all these steps and spend so much time thinking about a grudge. My process is to simply seethe with rage, over analyse the situation, think about it at 4am for a day or two and then move on.You see, I am not malicious, or I could easily insert here the name of some twaddler against whom I have a grudgekin. - Anthony TrollopeThe premise of this book is right, that grudges aren't that bad, we all have them and the trick is to recognise them and not pretend to be this peace and love ball promoting memes about forgiveness and letting go. That's rubbish, even if it's for a fleeting moment we have negative feelings, real or imagined. Some of us move on quickly and others, well hold a grudge!The author of How To Hold A Grudge is the extremely talented crime fiction writer Sophie Hannah and this is a bit of a departure to the realms of self-care. For me, it just didn't click and I have to ironically admit to holding a grudge about my lost reading time. Everything you ever wanted to know about grudges, including why they can be useful ie. reminds you of behavior from which you want to stay away…. But do you really want to know all that much about grudges? Great book! I am one to hold grudges, which she explains the reasoning behind why we hold grudges, and how we can be proud to say it! We also should process them and keep them in a grudge cabinet, which is ultimately for protection from future potential grudges. I thought for someone who isn't a psychologist, you need to take her opinion on this topic with a grain of salt. I liked some of the example grudges she used, but by the end, I was skipping over most of them and focused on the chapters t Great book! I am one to hold grudges, which she explains the reasoning behind why we hold grudges, and how we can be proud to say it! We also should process them and keep them in a grudge cabinet, which is ultimately for protection from future potential grudges. I thought for someone who isn't a psychologist, you need to take her opinion on this topic with a grain of salt. I liked some of the example grudges she used, but by the end, I was skipping over most of them and focused on the chapters that would help me, personally. Overall, recommended reading for those who hold grudges! I have not read this book authored by Sophie Hannah,so 2 stars for her time spent. Based on the title which I'll sum up,in my own words..."Holding a Grudge Against a Person,Who has NO Idea Why or Even IF You are Giving Them the Silent Treatment Based on Something They Unknowingly Did" I Have NO PLANS on Ever Reading it!! !Are YOU Kidding Me? This book should have been titled...."Holding a Grudge...One of Many Things that is Wrong With This World"
Funny book- helps you classify, categorize and rate your grudges. The author provides tools to help process complex ones also. I liked it just for having a process to use to reflect on my own and my personal severity. Some of the stories are actually good grudge worthy stories. kudos to the author for turning something negative into something positive and having frameworks to readers to takeaway. I was hopeful when the book noted that no one had written a book about grudges and that the author intended explore this psychological phenomenon. Unfortunately, explore seems to mean tell stories about stuff that happened to you and draw broad generalizations from an N of 1 and informal discussions with your partner. Some of the stories were entertaining, but the advice, conclusions drawn, and the “instrument” were not very (at all) scientific. I suppose this is how personality types got starte I was hopeful when the book noted that no one had written a book about grudges and that the author intended explore this psychological phenomenon. Unfortunately, explore seems to mean tell stories about stuff that happened to you and draw broad generalizations from an N of 1 and informal discussions with your partner. Some of the stories were entertaining, but the advice, conclusions drawn, and the “instrument” were not very (at all) scientific. I suppose this is how personality types got started too, but that research has been widely discredited. So, read and apply with caution. If you’re looking for entertainment, it’s ok.
As a professional grudge holder, I was excited to read this. However, I ended up feeling like I was duped into reading a book about the author’s personal grudges and why she felt justified in having them. There are good parts, but overall the book felt disorganized (lots of references to other chapters which got confusing) and the end was literally just a list of grudges. Probably enough for a good long essay but stretched into book form.I received an ARC from the publisher through Net Galley in As a professional grudge holder, I was excited to read this. However, I ended up feeling like I was duped into reading a book about the author’s personal grudges and why she felt justified in having them. There are good parts, but overall the book felt disorganized (lots of references to other chapters which got confusing) and the end was literally just a list of grudges. Probably enough for a good long essay but stretched into book form.I received an ARC from the publisher through Net Galley in exchange for an honest review. I think I am going to let this book go unfinished. I picked it up thinking it would be funny. While it is light in tone, I feel as though the author has taken a word with an agreed upon definition (she include four dictionary definitions in the text) and decided to commandeer it to mean something else. Near as I can tell, her book could be titled "How to hold onto Life Lessons - From Resentment to Contentment - the Power of Life Lessons to Transform Your Life". Maybe if I read on I would come to I think I am going to let this book go unfinished. I picked it up thinking it would be funny. While it is light in tone, I feel as though the author has taken a word with an agreed upon definition (she include four dictionary definitions in the text) and decided to commandeer it to mean something else. Near as I can tell, her book could be titled "How to hold onto Life Lessons - From Resentment to Contentment - the Power of Life Lessons to Transform Your Life". Maybe if I read on I would come to accept her definition, but I think I'll stick with the long-accepted definition. Update: I finished it after all. My general opinion is unchanged. I mostly enjoyed her writing style (though found many of her anecdotes portrayed her, in my mind, as rather petty & 2-faced) so may check out her fiction books. This book was awesome. I love my grudges! I have always loved Sophie Hannah's novels, loving the way they make me think all the way to the end instead of knowing by the second chapter who did what and how it will all come out. Nope, you usually wait until almost the last page so it is very satisfying to me to work to figure it out.When I requested How to Hold a Grudge, I saw her name and requested it, not realizing (or caring) that it was not a novel. This is a very entertaining and informative book on the whole theory and nurturing of I have always loved Sophie Hannah's novels, loving the way they make me think all the way to the end instead of knowing by the second chapter who did what and how it will all come out. Nope, you usually wait until almost the last page so it is very satisfying to me to work to figure it out.When I requested How to Hold a Grudge, I saw her name and requested it, not realizing (or caring) that it was not a novel. This is a very entertaining and informative book on the whole theory and nurturing of grudges. Unusual topic you say? Yes, but are there any of us who have never held grudges? Why not learn why we do and think what we do. Perfect them or unravel them?Nicely done! Thank you NetGalley for an advance reader copy in exchange for an honest review. I picked this book on a whim. I am so glad I did. Hannah makes some great arguments for the benefits of acknowledging that grudges are not always the wrong thing to have, it is how we handle them that matters. There is much we can learn from having them as often they serve to protect us. She also points out that we can be the subject of other people's grudges, something we should all keep in mind. There is a great deal to think about pertaining to grudges so I can see where referring back to thi I picked this book on a whim. I am so glad I did. Hannah makes some great arguments for the benefits of acknowledging that grudges are not always the wrong thing to have, it is how we handle them that matters. There is much we can learn from having them as often they serve to protect us. She also points out that we can be the subject of other people's grudges, something we should all keep in mind. There is a great deal to think about pertaining to grudges so I can see where referring back to this book will be something I do in the future. Thank you Sophie Hannah for writing a great book about a topic that we all can learn from. I LOVE this book!! It felt great to know that I'm not crazy for feeling the way I do about certain situations. It's very insightful into why we react to certain situations in our lives. This book really validated my own experiences with people in my life. I recommend this book. It's entertaining and insightful! Worth reading through to the end if only for the writer's personal and collected accounts of grudgeworthy events that validate the readers' own. I like that the writer sought additional feedback from multiple experts on the matter. I received a free digital copy of the book from NetGalley in exchange for an honest review. Loved this book. I personally don't care that she's not a licensed therapist as I feel degrees can be over rated at times. She definitely has an interesting take on holding grudges. Not all her ideas are beneficial in my opinion but she shed great light on tackling them and working through them in a very positive manner. Really enjoyed this book. Boy was this a fun book. Really funny, insightful and inspiring about grudges. Helps the reader to think about what is most important in her life and stand up for that, and in so doing, protecting one’s self. A 4.5 out of 5 stars. This would be a great book club book. I really was hoping this book would provide an interesting insight on how to deal with grudges and feelings of resentment but for the most part it just talked about grudges, and told grudge stories. I was not a fan of her writing style, thought many things were repeated and found myself skipping more and more pages. You keep saying that word. I don't think you know what it means. I was surprised that I liked this book. The title seemed so silly to me, almost like it was making fun at self-help books. I actually thought the book gave good advice. The writing is good and it is very, very funny. And it got me thinking: why don't I have more grudges? Why aren't I able to stay mad at someone who hurts me? I'm going to try her grudge system, and I bet you will too.